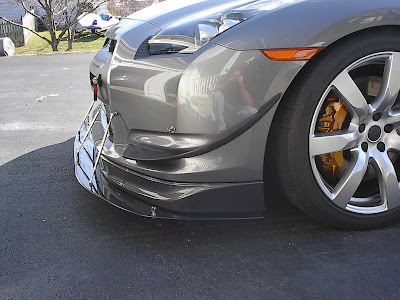 Some pictures from a customers Nissan GT-R that is tracked, and added some STILLEN canards, and APR front splitter, to generate some additional downforce for the track. 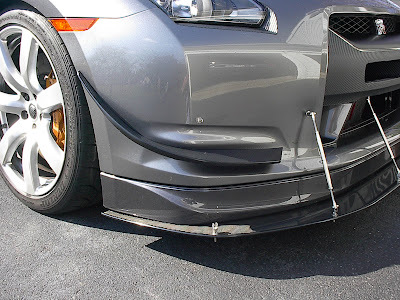 The additional front downforce, also helps to reduce some of the under steer inherent in the Nissan GT-R. In addition to the STILLEN GT-R, the Top Speed GT-R is also using this aerodynamic enhancement for their One Lap of America car. These canards accentuate the STILLEN GT-R Front Lip Spoiler for a more aggressive appearance. The aerodynamic advantages are applied with the Canards adding downforce to the front of the car. No painting necessary, installs in minutes! The fitment was very good and they are easy to install if you don't mind drilling holes in your front bumper. I already have holes for my splitter stays so it didn't matter to me. I would suggest that you use some blue masking tape to mark where you want each end to be. I used the measurements in the instructions as a starting point and then adjusted to get the best fitment. By the way, I also got the Stillen mud flaps and they do help cut down on the track rash from the marbles.